Not sure how to get your kids on the path to good oral hygiene? Let us help! Read on to learn how to teach your kids to take good care of their teeth and more importantly, to enjoy doing so. How Can I Teach My Children to Brush Their Teeth? Angle the Brush Correctly. The toothbrush should be at a 45-degree angle to the gums, so your kids can target bacteria below the gumline. Use a Light Touch. Kids tend to apply more pressure than is needed. Make sure they know the goal is to be gentle. Brush Thoroughly. When brushing, every tooth should be brushed on all sides. Additionally, you’ll want your kids to brush their tongues and the roofs of their mouths from back to front for the best results. Practice the Right Strokes. Teach your children to use short, sweeping strokes for chewing surfaces and short, round strokes for the backs and fronts of teeth. If your kids are under the age of 6, please continue to brush their teeth for them. They’re just too young at that age to do an effective job. When the responsibility of brushing lies on the child of any age, you should still check them to ensure a thorough job. Kids don’t have the proper dexterity to do a good job until about 9-10 years old. How Can I Make Brushing More Enjoyable for My Children? Let Them Choose Their Dental Supplies. Kids who don’t like to brush often enjoy the process much more if they can pick out their own toothpaste, floss, and an electric toothbrush. Kids with braces have more of a challenge, and may benefit from the use of an electric water flossing device. Listen to Music or Read. Your children should brush their teeth for at least two minutes twice a day. During those four minutes, try listening to music, reading a story, or making up one of your own about a brushing superhero who fights bad bacteria. Use a Brushing App. There are a number of really great brushing apps on the market, designed to help kids not only brush better but to also have fun while they’re doing so. To get started, check out Brush DJ or the Disney Magic Timer App, which claims to increase kids’ brushing time by 98%. Alternatively, you can visit the app store with your kids and see which brushing app they get the most excited about. 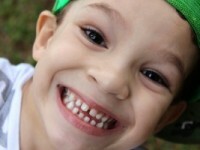 What Else Can I Do to Take Great Care of My Children’s Teeth? In addition to making sure your kids brush and floss daily, it’s also important to schedule dental checkups for them twice a year. During those checkups, we’ll clean teeth thoroughly, check for cavities, evaluate how their adult teeth are coming in, teach the importance of good oral hygiene, and send them home with a bag of goodies. If your children are due for their dental checkups soon, we encourage you to schedule their appointments today. This is actually our busiest time of year, because many of our patients are trying to take advantage of their dental benefits before they expire at the end of the year. So, to make sure you don’t miss out, it’s a great idea to schedule your dental appointments now. To do so, you can schedule your visit online or call our office at 614.328.9489 to request an appointment. We are located at 6304 Scioto Darby Road in Hilliard and offer early morning and evening office hours for your convenience.